• A genuine rose dipped in authentic silver. 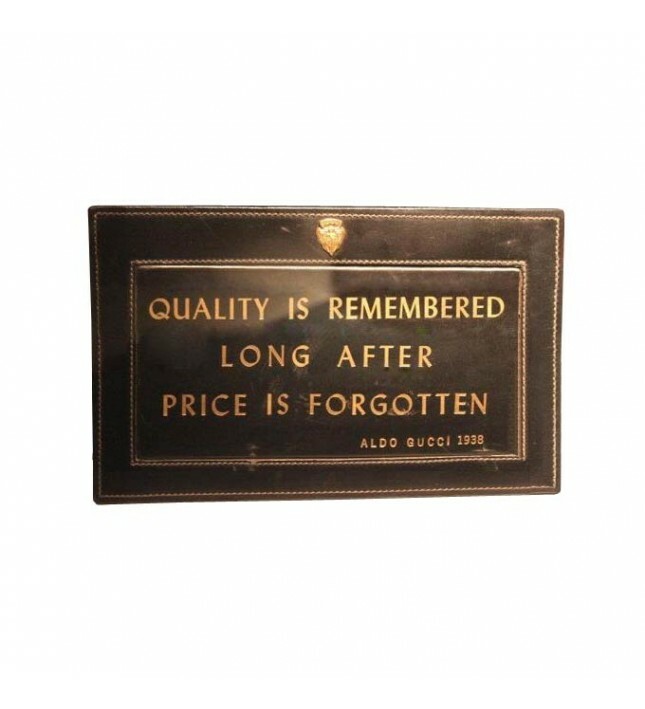 • Displayed in a stylish leather case with blue velvet interior. • Each rose boasts a lustrous mirror-shine appearance. 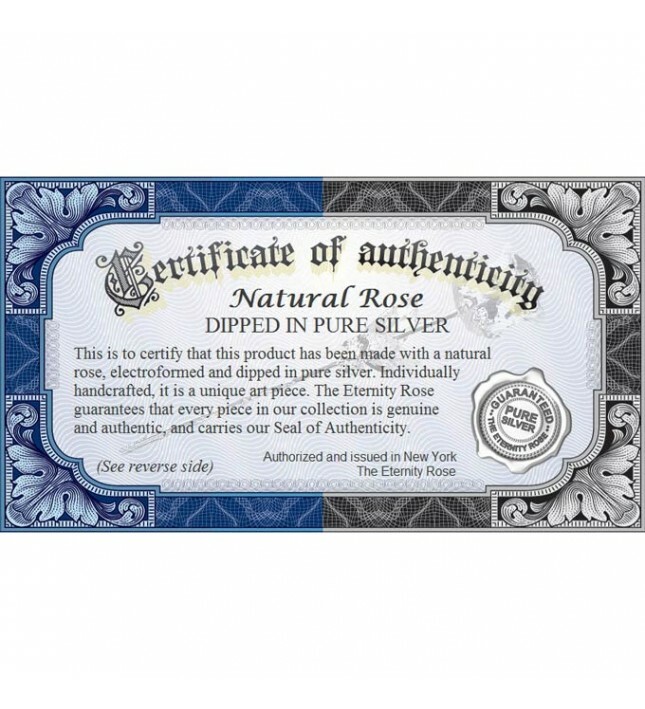 • An authenticity certificate comes with every item. • A beautiful and perfect gift for any couple's 25th wedding anniversary. • A long-lasting symbol of deep love. • Fast express delivery comes as standard. • Crafted from a genuine rose, clipped at the height of its splendour, and dipped in purest silver. • The silver-dipping process involves 60 complex steps. 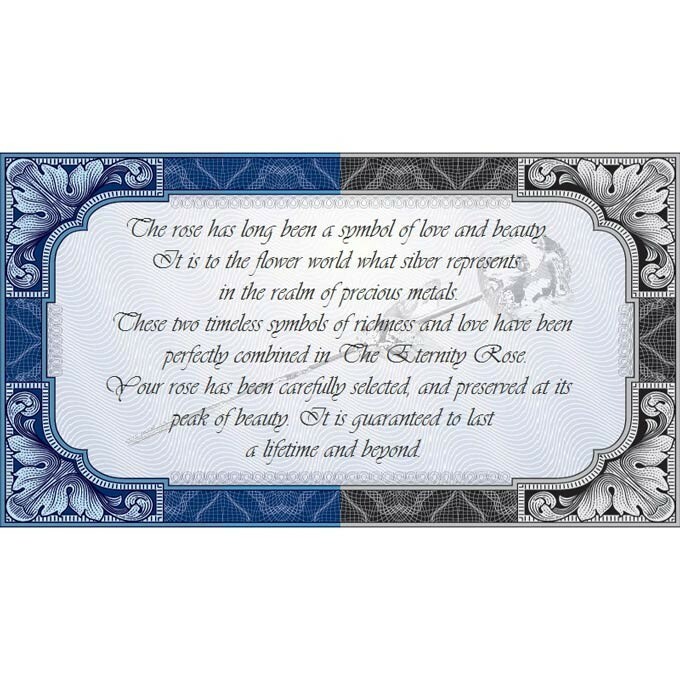 • A beautiful leather and navy-blue velvet case for displaying the rose comes supplied. • The finish is a lustrous mirror-like shine. • Almost one foot in length. • Each rose is an exclusive work of art. • An ideal gift for any silver wedding anniversary. All over the world, the rose has come to symbolise beauty and love, with silver also acknowledged as one of the ultimate expressions of wealth and luxury. 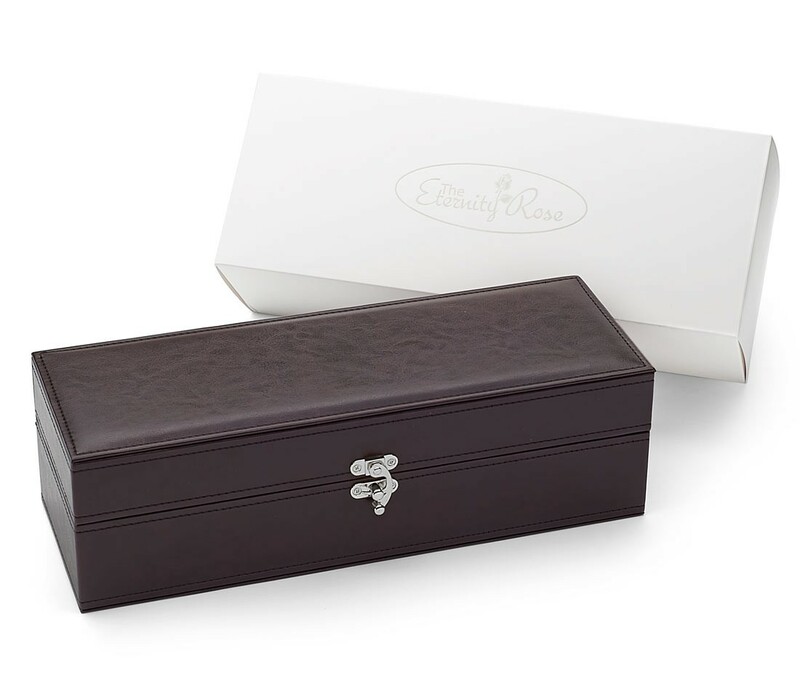 Now these twin facets have been combined by The Eternity Rose into a stunning gift that captures the essence of this magnificence in a fabulous work of art. 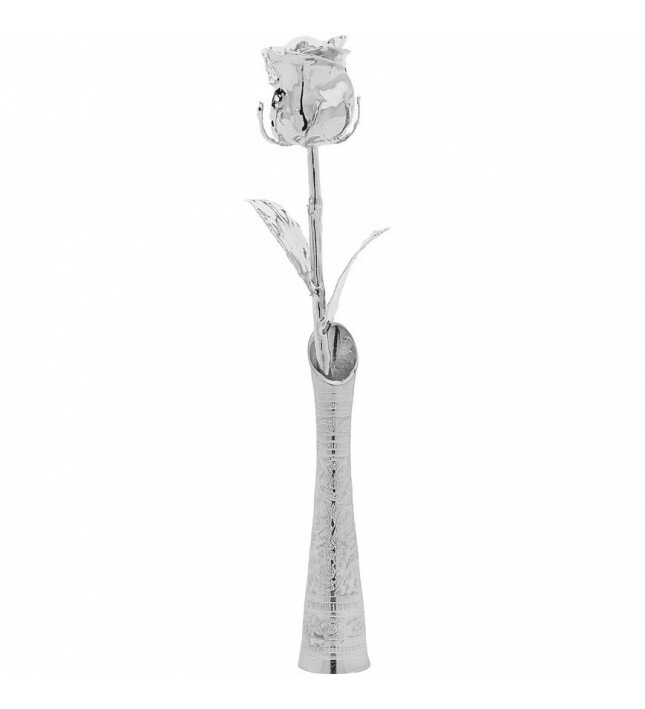 The elegant silver-dipped rose will undoubtedly delight every woman and be cherished for its deep significance. 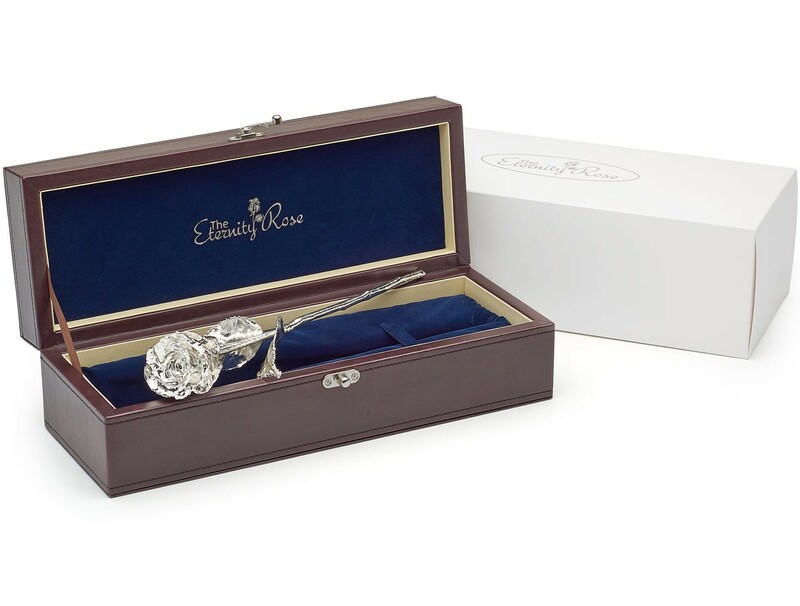 If you are looking for a long-lasting memento for a special lady, an Eternity Rose is simply ideal. A perfect gift for any special occasion, be it an anniversary, birthday, Mother's Day or Valentine's Day, there is no better way to show your partner how very much she is loved and appreciated. 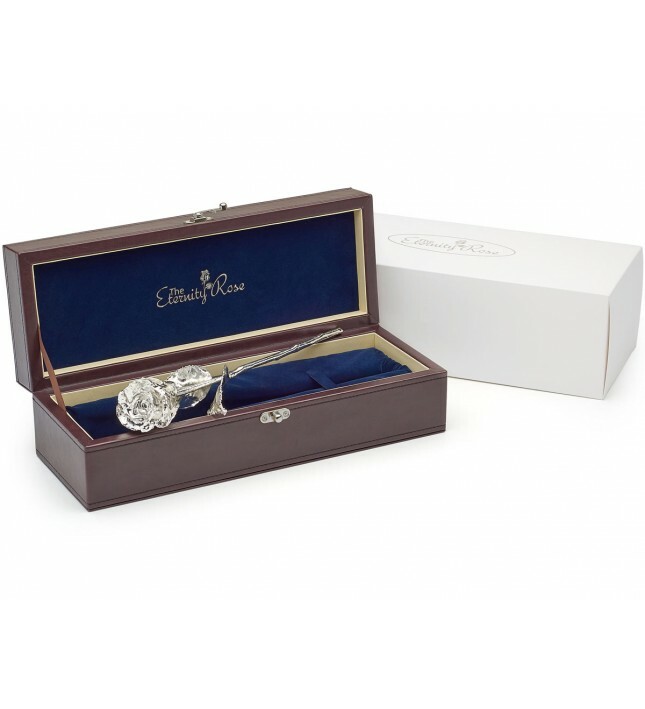 The silver-dipped Eternity Rose is also the most appropriate present to give a special couple who are celebrating a 25th silver wedding anniversary, or to give your wife on this milestone day. 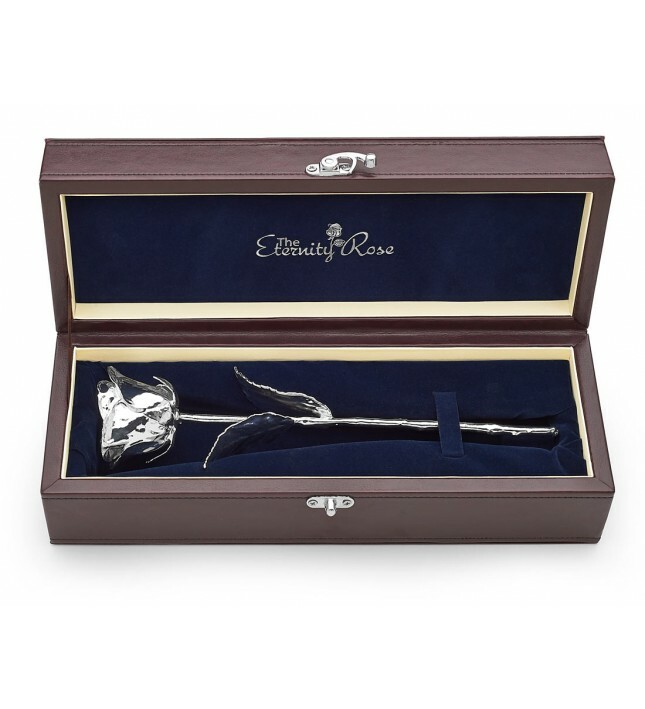 The Eternity Rose was inspired to combine the most iconic symbol of passion, the rose, with the luxurious symbol that is silver, and create a unique work of art which will be immortalised forever. Every Eternity Rose has been constructed from a real rose, hand-picked at its point of perfection. Our very own skilled horticulturists pay close attention to our flowers' growth and ensure that they are plucked just as the buds open to the optimal size so that they can begin the preservation process that transforms them into glorious works of art. There are 60 steps in the complex process to silver-dip roses, with individual layers being added by electroplating until the work of art is complete. First, a base layer of copper is added which protects the flower's intricate structure and renders its surface texture-sensitive. It is also the ideal foundation for the coating of a precious metal. Once the copper layer has been added, a layer of nickel is applied to strengthen the flower's structure in order to prepare it for the final stage of silver dipping. 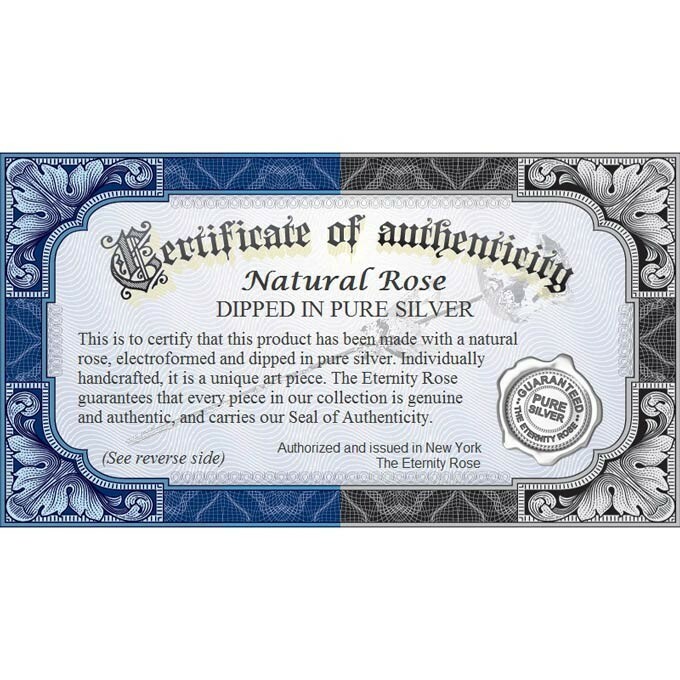 At each stage of the process, every single rose is subjected to strict screening processes to ensure that there are no imperfections, and only those which remain flawless pass on to the final step of dipping in pure silver. 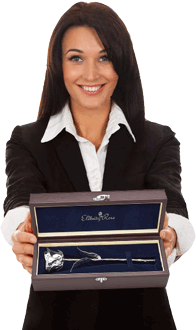 Once the blossom has passed the quality control procedure, the time consuming process of plating in silver commences. Over several weeks, layer after layer of silver is applied until the Eternity Rose achieves a lustrous mirror finish. When the brilliant and radiant Eternity Rose is placed inside its leather and navy-blue velvet-lined display case, it is showcased to its finest advantage. With a strikingly magnificent appearance, it is no wonder that the silver-dipped Eternity Rose never fails to impress and amaze the joyful recipient. 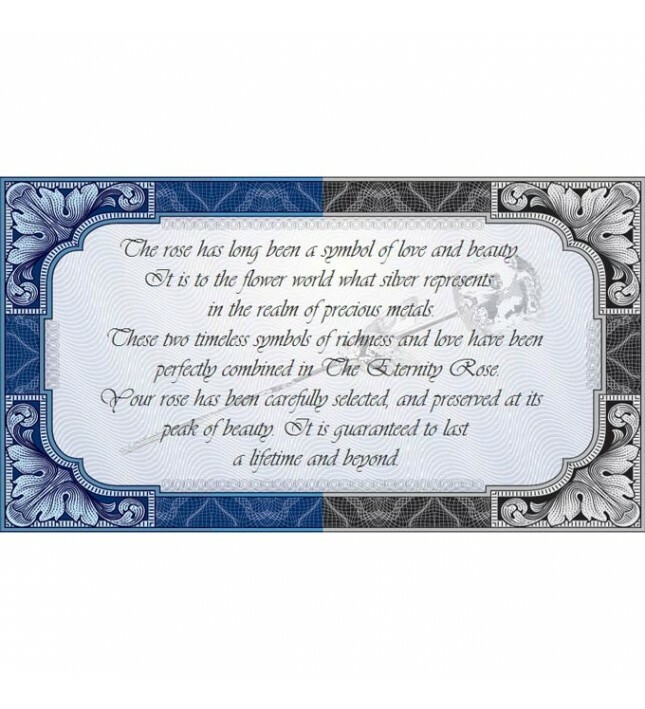 Although the entire process of producing an Eternity Rose takes a full three months, it is certainly worth the wait. 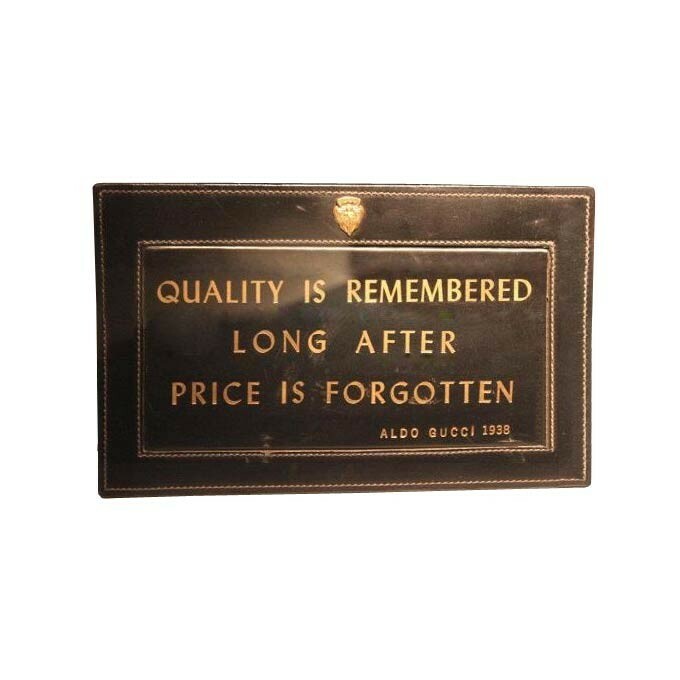 Presenting this artwork to someone you love to commemorate a special occasion is one of the finest ways to convey a message of esteem, love and appreciation. There can be no finer way to mark the occasion of the 25th wedding anniversary than by giving a stylish silver-dipped Eternity Rose. 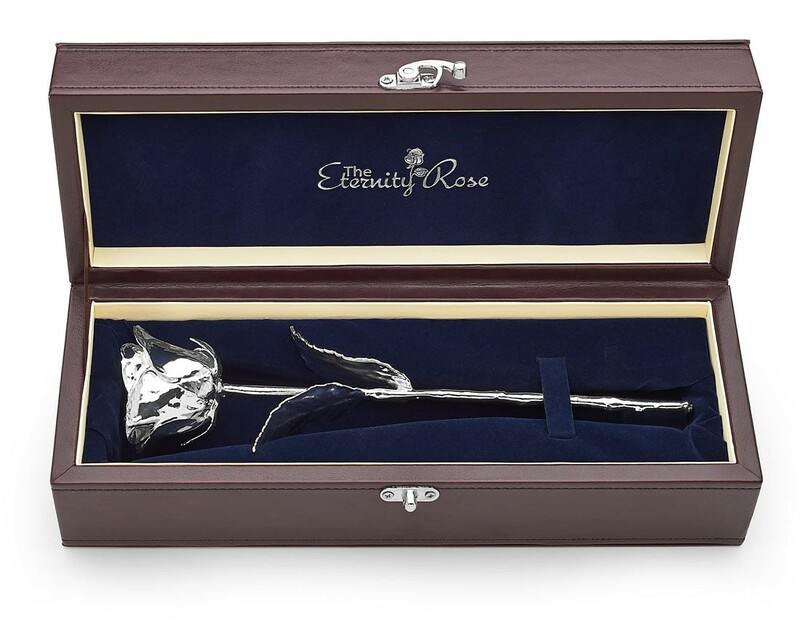 Demonstrate your love for a special person today by giving her the gift of a beautiful Eternity Rose. Love should last a lifetime, so what better way to convey this sentiment than with the enduring symbol of an Eternity Rose?